When the government taxes a corporation, the tax ultimately falls on some human being. When a corporation makes a decision, some set of human beings is behind that decision, and they are morally responsible for that decision. 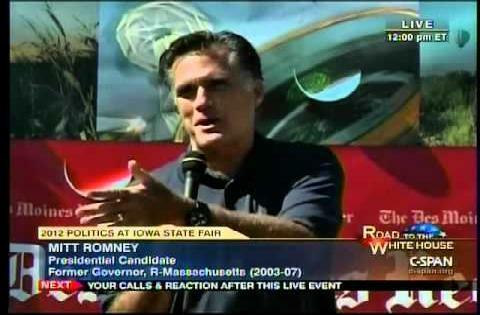 Mitt wanted to emphasize the first point: that any tax on corporations is ultimately paid by some human being. That is a sound principle in the academic field of Public Finance. The big problem with corporate taxes is that, despite efforts on the part of many economists, economists don’t have that good a handle on exactly who ends up paying them. Whatever someone says on this score, I think I can guarantee that it will be controversial even at the purely academic level–though I would be happy to learn of a widespread academic consensus on this that I missed somehow. So if the intent is to make taxes depend on income, for example, it is a lot easier to get the intended effect on that score by taxing people directly rather than by taxing corporations. I want to focus more on the second meaning: when a corporation makes a decision, some set of human beings is behind that decision, and they are morally responsible for that decision. By and large, those who have the most power in important corporations are well paid, and so count as members of “the rich.” So I will hold “the rich” responsible for decisions that corporations make. When a corporation makes a decision or takes an action that respects truth, I will attribute that decision to “the honest rich.” Whenever a corporation makes a decision or takes an action that does not respect truth, I will attribute that decision to “the dishonest rich.” To my mind, that adds moral clarity compared to talking about the decisions of, say, “Microsoft” or “Lehman Brothers.” When approaching corporate decisions ethically, it minces words not to recognize the people behind the decisions, even when their exact identities are not clear. Among some of those who viscerally reject the statement that “corporations are people” I think there is a hidden impulse that is quite dangerous: the impulse to read CEO’s and other key corporate decision makers out of the human race. Even when a CEO commits evil, he or she is still a human being, and needs to be treated with the dignity that everyone deserves for being a human being, despite his or her crimes. Now, although corporations are people, typically a corporation is not a person, but instead many people. To the extent that corporate decisions reflect the outcome of a game among many people (in economists’ technical sense of the word “game”), the actions of a corporation may not reflect any coherent objective function, as I discuss in my post Jobs And in that post, one of my key recommendations is each corporation be encouraged or even required by law to articulate what its objective function is intended to be, as a fictive legal person. Then its actions can be judged in relation to the intended objectives of the corporation. In that way, we can try to protect people from Frankenstein monsters of corporations that are doing things no one intends because of internal games being played. And this policy of asking corporations to articulate their objective function would help somewhat in clarifying whether the moral responsibility key decision makers in corporations bear is a responsibility for intending what the corporation did, or a responsibility for letting the corporation become a Frankenstein monster that is doing something no one intends. As I wrote the last paragraph, I was reminded of Adam Smith’s invisible hand of the free market that leads to good results that go beyond what the participants in the market intend. But unless a corporation were structured internally very much like a market, I don’t know of any theorem suggesting that an invisible hand will work within a corporation to make good things happen that no one intended. And the wisdom of literature such as Scott Adams Dilbert or TV shows such as The Office suggest, to the contrary, that entropy often reigns–so that corporations often do less well than the intentions of the people in them. Even in the small world of the University of Michigan and the medium-sized world of the Economics profession, I have seen how simple justice usually requires someone to put in serious time and effort to make that justice happen. Sadly, justice–or any kind of good behavior on the part of an organization–doesn’t come for free. I honor those who help make good things come from organizations, and hold responsible those who don’t, even if it is from inaction. Putting together everything I have said about the ethical sense of “corporations are people,” I come to a key point. For anyone who has a modicum of power within a corporation, it is possible to be a member of “the dishonest rich” by my definition without ever lying and deceiving personally, if by inaction one makes no efforts to prevent one’s corporation from lying and deceiving.